West Ham finally found a victory after a disastrous start to their 2018-19 campaign. 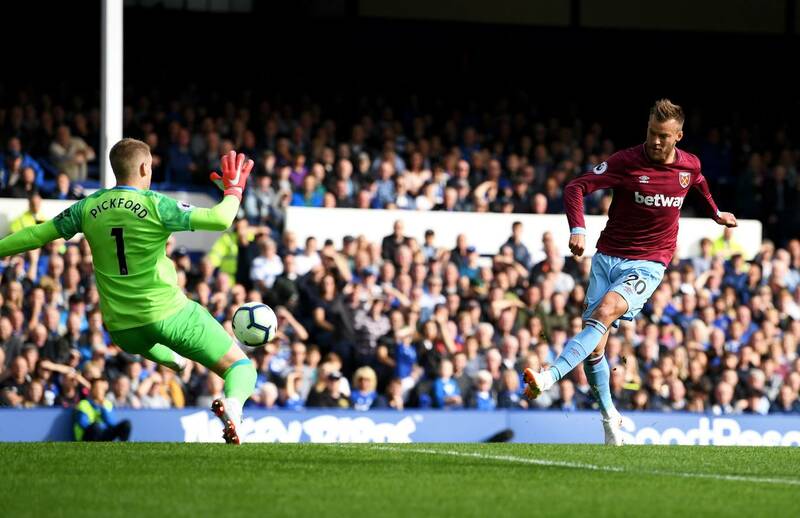 A first half brace by Andriy Yarmolenko, and a second half goal by Marco Arnautovic were enough to overcome a late, opening half goal by the hosts, as Manuel Pelligrini earned his first league victory with the Hammers on a Sunday afternoon at Goodison Park. The early scoring began with Pedro Obiang working some one-two work with Arnautovic, who selflessly passed off inside the penalty area to an unmarked Yarmolenko for his first Premier League goal. In the 31st minute Everton gave the ball away and Yarmolenko took the ball and shot from 20 yards out. His strike hit the top right corner, well beyond Pickford’s reach, and with that, the Ukrainian had his first and second goal during his first Premier League start. Marco Silva’s team showed great fight and narrowed the margin late in the first half stoppage time as Gyfli Sigurdsson headed home a goal off a well-developed Jonjoe Kenny cross. With the 1-2 score sheet at the half, the Toffee’s reclaimed some momentum after West Ham had control of much of the match. No changes were made during the break. Early on in the second half of play it was Obiang and Arnautovic playing one another again, as Arnie was able to give West Ham their third goal of the afternoon, sliding his shot low and past Pickford. With the two goal margin once more, West Ham looked to preserve their lead and earn some much needed points. In the closing minutes of play Everton really upped the pressure. Their closest chance was an 84th minute when Oumar Niasse had a great volley that struck the crossbar and was cleared. Beyond that, West Ham was able to close out the clock, and after five minutes of added time, the Hammers secured their first victory of the season. With the win, West Ham vaulted from last to 16th in the table. The win was doubly vital to this struggling club as the next matches are against league-leading Chelsea, and Manchester United. While the London Stadium will host both of those matches, no one has accused West Ham’s home ground of being much of a fortress. But Pelligrini had his squad set up well today, and the team had the right attacking mindset to really take the match to Everton for 90 minutes. Of note, the return of Mark Noble might have provided some on-pitch leadership. What he lacks in pace and technical ability, he seems to make up for in making his teammates play better. The most important question of the coming week is the health of Marco Arnautovic. Arnie has been involved in 11 of West Ham’s last 16 Premier League goals, and the entire team looks less dangerous without him. A prolonged absence would really set this team back. Finally on the gaffer’s 65th birthday he was able to show a glimmer of his vision with this club and his £100 million summer. Whether this side is able to build on today’s victory will be tested next weekend, but until then there is a bit of relief throughout East London. Please continue to check TheWestHamWay.co.uk for all the latest on team news and transfer updates. Everton: Pickford, Digne, Zouma, Holgate, Kenny, Schneiderlin, Gueye, Calvert-Lewin, Sigurdsson, Walcott, Tosun. West Ham: Fabianski, Zabaleta, Balbuena, Diop, Masuaku, Rice, Obiang, Noble, Yarmolenko, Anderson, Arnautovic.